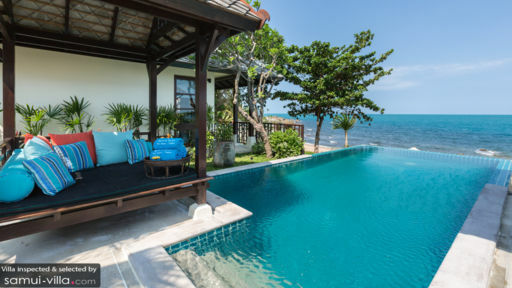 The Beach House is a stunning beachfront property in Koh Samui, Thailand overlooking the turquoise waters of the ocean and only a few minutes from Choeng Mon beach and Chaweng beach. 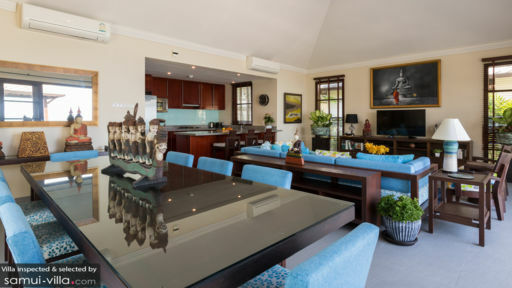 The villa is a four-bedroom, luxury home that has plenty to offer in terms of modern amenities, beach access (only 10-metres), luscious green gardens, and even outdoor sitting and dining for a wholesome experience. The infinity pool stands in the middle of four pavilions spread out in a U-shape. Three pavilions house bedrooms while the main pavilion is dedicated to the main living and dining spaces. There are four bedrooms at The Beach House found in different pavilions locate around the main living pavilion and the swimming pool. The master bedroom is adjacent to the living pavilion with a king-sized bed and a private terrace for splendid views. The bedroom is bright and airy owing to the terrace where you will also find a daybed for some unplanned naps. The en-suite bathroom is luxurious with an outdoor shower for a tropical experience unlike any other. The second and third bedroom share a balcony with mesmerising views of the Gulf of Thailand and each has been furnished with queen-sized beds. They are found in the third pavilion and come with modern amenities such as air-conditioning and even a private garden and the back. En-suite bathrooms accompany both rooms. The final bedroom is individually found in the fourth pavilion with twin beds that can be joined and a writing desk. This bedroom has its own bathroom with outdoor shower. Found in a picturesque setting, the infinity swimming pool at The Beach House is spectacular as it seemingly meets the ocean as one. The turquoise waters are resplendent under the tropical sun and what’s more, you have your own stretch of sandy beach out right out front. The complete vista comprises the ocean, sand, a well-manicured garden, and the amazing swimming pool. Enjoy some refreshingly perfect moments while relaxing outdoors on the sun chairs or you can request for an outdoor sala to be set up for you. There is a poolside sala already found overlooking the ocean with an alfresco dining area. Just a few steps from the pool deck and you can head to the living room at The Beach House. Owing to the glass doors that slide open, you can relish the stunning view at all times even while indoors. Apart from ample natural light and fresh air, the living room features bright shades of blue to complement the ocean as seen on its comfortable sofas, throw cushions, and upholstered chairs. The vibrant room is equal parts modern and traditional with an understated homely vibe present to make you feel right at home. The air-conditioned living room is, in fact, a space for the dining area and kitchen as well. To the corner of the living area also with enviable views is the nine-seater dining table to accommodate all the guests of the villa. If you’re looking to book the villa for a private event, the space provided is perfect for the same. The modern kitchen is equipped with amenities and appliances for your convenience and you can even hire a private chef to taste some local flavours and delicacies. While resting on the sofa, you can watch movies on the satellite-TV that comes with a DVD player. The Beach House is part of a private complex thus offering guests a chance to make full use of its many amenities including buggy service, restaurant, gym, beachside pools, and kids’ club. The villa itself is fully-staffed with all daily chores looked after and you can request for other services such as laundry, massages (charged extra), transportation etc. 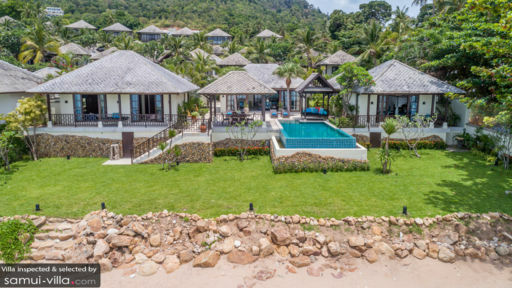 Found in a serene spot on the beach overlooking the Gulf of Thailand, The Beach House is in true essence a perfect holiday home. Although you are in a tranquil spot, you can easily head to the busier Choeng Mon and Chaweng areas with restaurants, beach bars, and family-friendly beaches for some fun activities.